We are so pleased to have Dr. Yancey as a Baylor PDI Faculty Fellow. Her work with congregations and public deliberation models is a fascinating venture into research and praxis in the community and is a significant expansion upon public deliberation as a civic engagement model within religious/faith communities. In addition to her responsibilities as professor, Dr. Yancey is one of the principal investigators of a $1.1 million, three-year grant to strengthen congregational community ministries. This work builds on her 25 years of ministering to congregations in inner-city Philadelphia helping them create and implement programs and services to address the needs within their neighborhoods. In addition, she served as executive director of the Greater Philadelphia Food Bank, a nonprofit organization that focused on the distribution of food and human services to 1,000 charitable agencies that served marginalized and at-risk populations. Each semester she invites us to teach public deliberation, facilitation, and naming and framing in her Advanced Community Practice course. She also introduced public deliberation, using the Divided State of America issue guide, at an ethics workshop for social workers (about 150) in September at the Texas Children’s Medical Center in Dallas in September. Additionally, every social work intern involved in the Center for Church and Community Impact (C3I) is being trained by Baylor PDI to utilize these concepts and become trainers in congregations. As a part of the Congregational Discernment grant she received, one of the major questions being asked is about a congregation’s discernment processes, which includes public deliberation as a tool of discernment. 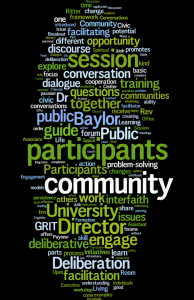 Dr. Polson’s research with Baylor PDI is a fascinating look at civic engagement, religious identities, and other intercultural identities and contexts. Dr. Polson joined the Baylor Social Work faculty in 2014. Before coming to Baylor, he served as Assistant Professor of Sociology at Messiah College in Grantham, PA and at Louisiana State University in Shreveport, LA. His research interests include community engagement, civil society, the intersection of religion and civic life, and the work of non-profit organizations and voluntary associations. Dr. Polson has also been involved in applied research projects with community organizations in Texas, Tennessee, and Pennsylvania. Each semester he teaches principles of public deliberation in his classes and has students participate in a classroom-based public deliberation forum. Welcome new Baylor PDI Faculty Fellows!